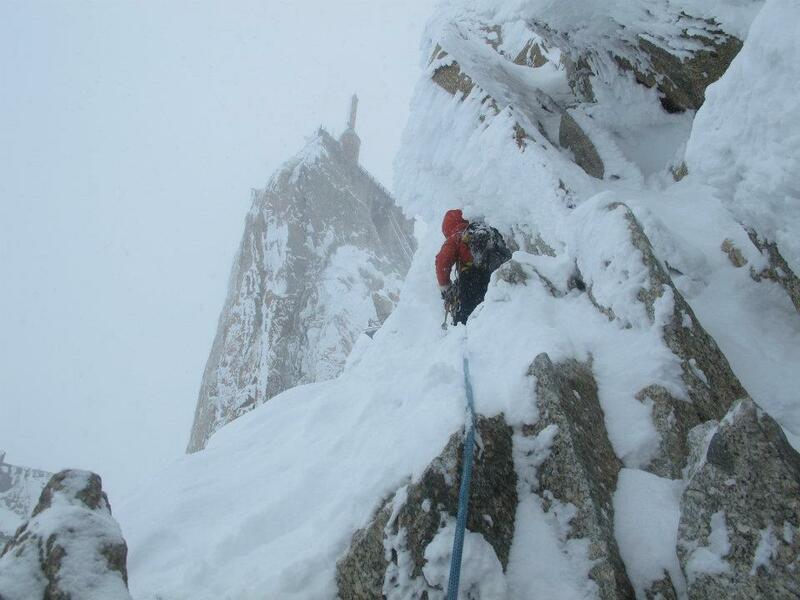 The day after climbing Chere Couloir (late Jan) the weather came in cold and generally not very pleasant, the temperature dropped to -25 and it had snowed during the night. With the weather forecast looking like it was only going to get worse we had to weigh up our options. I had hoped to go down and snow-hole underneath some of the big routes on the back of Tacul, but if the weather was bad it would only mean a longer walk getting ourselves, and all our kit, off the mountain. We decided to climb the relatively easy Cosmiques Arette with our day-packs full of stuff to leave at the Midi station and come back for the rest of our kit. We figured it would only take a couple of hours so we had a leisurely 11am start. The weather was seriously cold and the snow conditions were poor. There was two to three feet of fresh snow making climbing generally slow. By the time Oli had climbed 40 metres up the route I was already pretty cold and with every plunge of my ice axes and hands in to the snow my hands just got colder. The snow blasts melted on my face and, due to the extreme cold, immediately froze again forming lumps of ice on my eye lashes – freezing my eyes shut. The route climbs to a mini summit from which you abseil down twenty meters or so to get onto the next section of climbing. Unfortunately due to the snow heaped up on the ledges Oli lowered too far and we ended up off route. By this time the wind had really picked up and the snow was relentless. After Oli traversed with no pro for about 20m he was able to climb up a steeper section of mixed climbing to get us back on route. As I joined him at the next belay we were back on track, but due about an hour hanging at the belay in fairly ferocious wind my hands were very cold and stopping after climbing I experienced the most intense and painful hot aches. Although Oli was leading the entire route in one block the main thing I had to do was suffer diligently. Another section required me to take the rope in tight and then lower Oli down a small cliff to get back on to the route however, when I got there, I could not lower off without some serious faffing. It meant down climbing what is normally rappelled – which can suggest that it is not totally straight forward. I figured I could smarm my way down the snow built up in the corner, and I could see a small rock jutting out down the face that I could place my foot on. With good 8m fall onto the slope below, followed by a long swinging slide as a result; falling was not a good option. I committed to the down climb. As I climbed down the face the tearing wind blew gushes of fresh snow straight up into my face as I disturbed it with my movements – this forced me to shut my eyes while it cleared. The snow blasts melted on my face and, due and to the extreme cold, it almost immediately froze again in the form of ice lumps welded to my eye lashes- freezing my eyes shut. I was practically blind, just smearing and scraping my way down, slightly helpless in my effort to guide myself to the small rock jutting out of the vertical wall I set off to reach. I eventually found it with my foot, and with that I was able to reach to a point where my ice axe caught in a crack in the rock and give me some security. I put my face in the side of my hood and defrosted my eyes so I could open them properly again. The next belay was the most exposed; and it was probably amongst the coldest I have ever felt – it was also before the most intricate climbing on a snow and rime covered route meaning Oli was climbing slowly. I stood watching the rope move, or not move, for what felt like about an hour being buffeted by very strong, freezing wind and snow. I also wondered what the hell was I doing there when I could be somewhere warm, perhaps somewhere with a beach, and a nice bar serving nice warm food. The rope was not moving fast enough, I was practically begging for the rope would move and in the mean time time doing full body tenses, starting in my fingers to my forearms, my shoulders, to my stomach, then my legs and my toes and back in an attempt to stay warm. In all honesty was really not wearing enough, but we did figure we would do this route a lot faster, and if it got really bad I could have got my down – stupidly at the bottom of my bag (with heaps of junk on top meaning that half of it would get lost should I unpack). 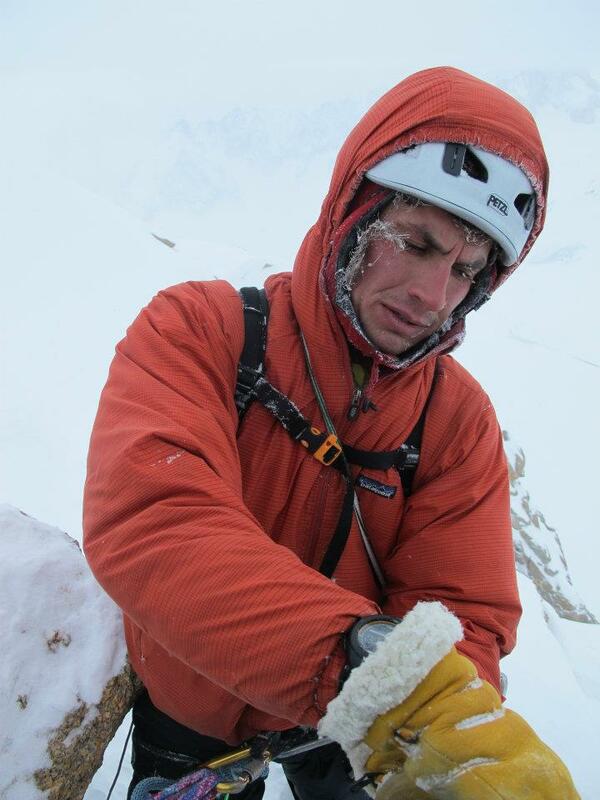 My main insulation was a Rab Xenon jacket, a couple of base layers and a waterproof shell. The Rab Xenon is a jacket that I now really rate – brilliant warmth to weight ratio – but not really enough for such conditions. The rest of the route moved on the other side of the ridge, which meant some seriously welcome shelter from the wind, and also meant less snow. But that was not the end of our difficulties; due to the weather over the past week there was a massive amount of rime; up to three feet of it sticking out of the rock meaning that as Oli climbed he had to dig/mine his way through the entire route – sometimes just to find where we were meant to go. Every single gear placement had to be dug out of the rime, and to find a crackplacement meant clearing whole areas. As I crawled over a thin ledge of snow under a roof of rime, and made an acrobatic swing over to a hanging block, the air had cleared and we could the 800 meter more or less vertical drop down towards the glaciers that lead to Chamonix. Mostly, Oli had traversed with little gear, falling is not an option and I just remember thinking that although a commonly climbed route, in these conditions, it was actually pretty wild. We finished the route, I am not quite sure how long it took us, but we agreed the conditions were probably the worst you could find to climb it. 2ft of rime on one side, 3ft of fresh snow on the other with constant wind causing what was probably a wind-chill of -40 C. And to remind me of the coldness it has taken about two months for the feeling to come back to the ends of my toes. As we got in to the Midi station, it was not far from getting dark and, with the large amount of snow that had fallen, we decided to sleep at the midi in the toilets. It was warm, but so bright and dusty from building work it was a disgusting nights sleep. On the plus side; the new toilets have a heater so future residents may find it more palatable. The next day we carefully avoided avalanche risk spots, got our bags from the hut and got off the mountain. Sadly we found out that the day before a snowboarder/skier died in an avalanche not far from the hut; it did illustrate that we were right to be cautious.